Along with a couple other books, I picked this book up from the library because it was listed in an Audible "First Book In A Series" sale. Yay for libraries, saving me $25! I wanted to like this book. I really wanted to like this book. The book is a fictionalized retelling of the story of India's emperor Jahangir's twentieth wife, Nur Jahan. I'm not really giving away the ending by mentioning that part, as the title of the book, and every history book that discusses her, gives away the ending. I did not particularly enjoy this book. The fictionalized story part I don't mind, and can overlook. The perfect hair, perfect teeth, perfect man swooning of Mehrunnisa / Mehr-Un-Nisa for Salim, however, I do mind. That and the sudden insertion of elaborate descriptions of the foods being placed in front of the Prince, without context or lead-in just BOOM let's talk food! was too jarring to read easily. I liked the exposure of a new part of Indian / Pakistani history. I went down the Wikipedia rabbit hole for a while, which I appreciate this book for the introduction. The book itself, however, not a fan. 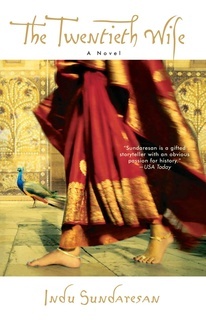 If you're a fan of swooning, Indian history, and historical fiction, sure, this book is a good one to add to your list. Otherwise, skip it. Ghias would not even think of her, not even by name. What use was it, when someone else would look after her? Imagine the internal devastation resulting from the knowledge that you couldn't take care of your own child? Ghias stared at him, unable to believe what he had just heard. After so much trouble, when one problem seemed to come at the heel of the other, here was a gift from Allah. The older she became — she was now fourteen — the more Bapa and Maji imposed restrictions on her. Do not go out too much; keep your voice down; pull your veil over your head when a strange man, one not of the family, comes to visit. These restrictions would be part of her life from now on, for she was a woman. He had been content until now to be heir to the throne. But during the last few months, his courtiers had pointed out, quite rightly, Akbar’s extreme injustice in remaining steadfastly alive while Prince Salim was mature enough to take over the duties of state. More glaring from me. As if a parent owes anything to a child upon death. He had everything he could want: handsome looks; virility, which had been proved twice by the birth of two sons; several wives; and an equal number of concubines. Yet, he had nothing without the crown. He should rebel, as Mahabat Khan and the others had suggested. What a burden the crown was, he thought. Kings had always fought brothers and fathers and sons for it. "We have decided to honor him, Ghias. And what better way to do so than to give him the hand of your daughter in marriage? It will be a good alliance." Okay, this was completely rage-inducing. I know it is a pervading belief, that daughters are property of their fathers, but it is so completely and totally wrong. “When you go home tomorrow, you must tell Ali Quli. He should have been the first to know. There must be no sense of impropriety in what you do, Nisa. No one should be able to point a finger and say that what you did was wrong. Appearances must be maintained at all costs.” Mehrunnisa sighed. There were always strictures in society: how one must live, eat, even what to talk about and what to keep silent on. When she had been younger it had been easier, sheltered as she was under Bapa and Maji. But now, as a married woman, she came under very close scrutiny. When her hands and her mind were busy, she did not have time to think — of what might have been. Maji had always been practical. There was too much else to do to spend hours in idle contemplation of how life could have turned out, if not for this or for that. Now she would no longer have to watch other women with their children and feel as though the ache would consume her. She too would have a child, so she could grow old and fretful and have that child indulge her whims. Mehrunnisa laughed. When they reached the house, Mehrunnisa saw most of the servants gathered in a crowd in the front courtyard, their faces hostile. Some of these women were mothers themselves. Surely they would have more knowledge of childbirth and birthing than she did? Why did they not go to help Yasmin? It was nothing but prejudice and sloth and a small kind of meanness. Yasmin was an orphan with no protector, pregnant without being married. They had ostracized her for the last six months. And Mehrunnisa had allowed them to, angry herself, in a deep deep pain that this woman should carry her husband’s child, while she could not keep one within her for more than a few months. For Akbar taught him also that kings always kept their appointments and followed orders. If one did not know how to follow orders, one would not know how to give them. Now, with his desire for a son, Mehrunnisa was tormented. What if she did not give him a son? “Maji...” Mehrunnisa whispered over and over again, wanting the cool comfort of her mother’s hand on her brow, wanting to tell her of the fears that ambushed her. For most, there is no safer place in this world than in a mother's arms. The initial euphoria of being an Emperor had worn off, and the enormity of his obligations now came crashing on Jahangir. Millions of people depended on him. Yeah. Power, the great corruptor. Life at court was this unending circle of give and take. You took from one person and gave something back — to that person, or another. His was one of the greatest minds in the empire, but even he was fallible... and human. Ghias watched her in silence, forcing back his own tears. What good would crying do? Ease the heartache for a few hours, perhaps, but the worry would always be there. Why Allah, why did trouble come to ambush when one was already down? “There is only one way.” Nuruddin glanced back again to assure himself that the guards were out of earshot. No. There is rarely "only one way," especially in the games of power. The zenana was always thus: prying eyes everywhere, whispered conversations in the air. To try and escape it was futile. The only thing to do was to live with it as best as one could—alert, vigilant, for ignoring it was also dangerous. There was already talk about her wiles in capturing the Emperor’s interest and holding it for so long. She was a sorceress; she had cast a spell on him. These rumors were hurtful and mean, but they came from mouths that were otherwise filled with envy.